Association of Ego-Futurism areopagus. Seated: Ivan Ignatiev. 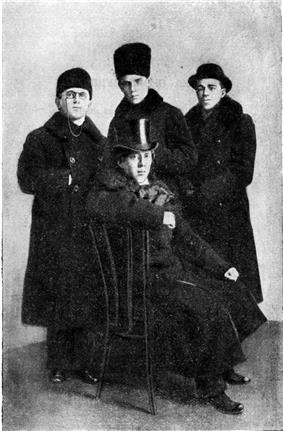 Standing: Dmitri Kryuchkov, Vasilisk Gnedov, Pavel Shirokov. Ego-Futurism was a Russian literary movement of the 1910s, developed within the Russian Futurism by Igor Severyanin and his early followers. Ego-Futurism was born in 1911, when Severyanin published a small brochure titled Prolog (Ego-Futurism). Severyanin decried excessive objectivity of the Cubo-Futurists, advocating a more subjective attitude. Although other Russian Futurists dismissed the Ego-Futurists as puerile and vulgar, Severyanin argued that his advancement of outspoken sensuality, neologisms and ostentatious selfishness qualifies as futurism. The Ego-Futurists significantly influenced the Imaginists of the 1920s. Russkiy futurizm. Teoriya. Praktika. Kritika. Vospominaniya. ('Russian Futurism. Theory. Practice. Criticism. Memoir.'). Moscow, 1999.